Lifting equipment expert Genie recently introduced its newest self-propelled telescopic boom lift capable of reaching heights of a whopping 180 feet at international construction trade show Bauma 2013. Genie has broken world records with its new telescopic boom lift, the SX-180 which is capable of reaching heights of up to 180ft. The show was held on April 15-21 in Munich, Germany. 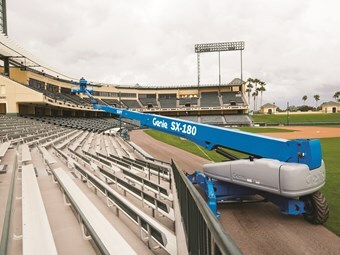 On top of being the world's tallest self-propelled boom lift, Genie also claims the SX-180 to be the largest of its kind on the market. The company adds the lift is suitable for applications in the oil and gas industries, commercial construction, industrial construction and maintenance, and general maintenance. Genie's parent company, Terex AWP's Booms and Telehandlers Senior Product Manager Scott Krieger says the lift was developed as a result of input from customers who are always looking for new and innovative ways to carry out their work more efficiently. "We have pushed the limits of innovation in the aerial industry by successfully producing results beyond expectations," he says. Genie Australia General Manager Brad Lawrence says the SX-180 is a remarkable new product with particular relevance to the Australian market. "The SX-180 delivers a clear benefit to Genie customers," he says. "The landscape of the Australian AWP market may not be unique, but we do have a wide range of challenging height applications which will drive high demand for the SX-180." "We are committed to servicing the specific height requirements of building maintenance, construction, telecommunications and mining with the Genie SX-180." The machine features a 54.9m (180 ft) vertical reach and 24.4m (80ft) horizontal reach, providing a platform ideal for the most extreme access jobs. The 2.44m (8 ft) by 0.91m (3 ft) platform has an unrestricted capacity of 340kg (750lb). The 3.05m (10ft), 180 degree, rotating jib positions workers and gear exactly where they are needed. Genie adds the machine is designed to be driven at full height. Travel speeds vary based on boom position and range from 4.02 km/h with the boom in the stowed position, 0.65 km/h below 38.1m (125ft) and 0.17 km/hr above 38.1m (125ft). The newly designed X-chassis extends and retracts to provide both stability on the job and a narrow profile for transport. With a stowed lentgntth of 12.98m (42 ft 7 in), the 54,000 lbs machine requires no over width or over heigh permits alloing it to be easily transported on a truck. "This X-chassis design is also used on our new Genie ZX-135 articulating boom introduced earlier this year," Krieger says. "This allows our big booms to share many design features providing parts and operating commonality." Genie adds the SX-180 was designed with reliability and serviceability in mind with easily accessible main systems and components, robust hose and harness routings and access to slew bearing bolts from topside. The rotating jib offers a robust slew bearing and worm drive arrangement. New platform controls include toggle switches and fully proportional jib and boom controls. The ground control offer an updated function diagram layout and tactile membrane switches. The machine also comes with a 50 gallon fuel tank for longer run time and a 7.5 kW generator. Worldwide availability will begin in the second half of 2013.